Did you complete the Espresso Idling Resource quiz? Here comes the solution! In the quiz, the test fails because we were verifying the text before the loading dialog dismisses. To make it pass, we can add an idling resource that is only idle when the dialog is not shown. The idea is to query the FragmentManager with the tag of the loading dialog. If it is null, the DialogFragment is not there, and we consider the app idle. We create an DialogFragmentIdlingResource with the tag from the loading dialog so that it knows what to wait for. With that, the test will wait until the loading dialog dismisses before proceeding. And now the test passes! https://github.com/chiuki/espresso-samples/ under idling-resource-dialog-fragment on the solution branch. Our first meetup was on June 9. We brainstormed for our first project, and decided to enter a hackathon together. It was a great way to bootstrap our efforts, using the hackathon to impose a real deadline. We worked from home after the meetup, keeping in touch on Google Hangout. The time pressure made it a bit stressful, but it was so rewarding to see the group working together and finishing the app in 3 weeks! And I am wondering: Is this enough? Do people understand? To figure that out, I made a quiz! Fork the repo and commit your answer there. Reply to this Google+ thread with a link to your repo. The solution will be posted in two weeks. Two weeks has passed, so here is the solution! How to test a watch face? Fit Cat is an Android Wear watch face that shows the time with a different cat depending on how many steps you walked that day. How do you test something like that? Walk a lot while looking at your watch all the time? I wrote Fit Cat with a modular structure that allows both unit testing and instrumentation testing. All Android Wear apps have two modules, mobile and wear. I made them both depend on a ui module, which has the implementation for rendering the bitmap for the watch face. This in turn depends on a lib module, which is a pure Java library. The number of steps decides the action level, each mapping to multiple actions. Within that level, an action is picked randomly. Within that action, the time determines the image for the animation frame. The watch face calls actionStore.getImage(time, steps, randomizerValue) to get the image file name. 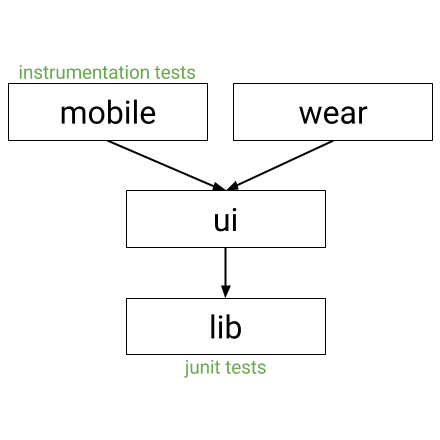 In the junit tests, various values of time, steps and randomizerValue are passed to that function, and the resulting image file names are verified. Besides verifying the logic, I also want to visually inspect the rendered bitmaps. The ui module has a Renderer class with a function drawWatchFace(canvas, steps, action, time, batteryPercent). I test this function by adding an InstrumentationTestCase to the mobile module, which enumerates all possible actions and write the animation frames to sdcard. I then combine them into animated gifs for visual inspection. Since the wear module also uses this Renderer class from the ui module, I am confident that the layout for all the different animation frames are good. Plus, I get to see all the cute actions Fit Cat does!